It’s been one year since Michael over at A-Wing and A-Way let us know that there really IS a Draw a Bird Day celebration every year on April 8…..and we’ve been celebrating our wing-ed friends on the eighth of every month since! Thanks for enlightening us, Michael! It is so very cool to have a holiday just for drawing birds. I want to thank Kathy over at Backyard Bird Nerd once again for a tremendously crisp image of a red-winged blackbird for this go-round. Loved them all, and so hard to choose every time from so many wonderful images, Kathy. This is my very loose interpretation, lol. Busy season is keeping me…..busier than normal this year, and so I didn’t have time to create what I call “postable” art on April 8. So I made a slapdash attempt today, instead! I want to thank my friends Nina and Kerfe over at Method Two Madness for helping us keep WP flying this month, and hosting the April annual/monthly DABD celebration! I hate to post on the fly, but my birds are playing the field today and I have to catch ’em while I can! I hope to catch up with all of you soon. (Yes, I will need real wings for that!) Tweet tweet to all! 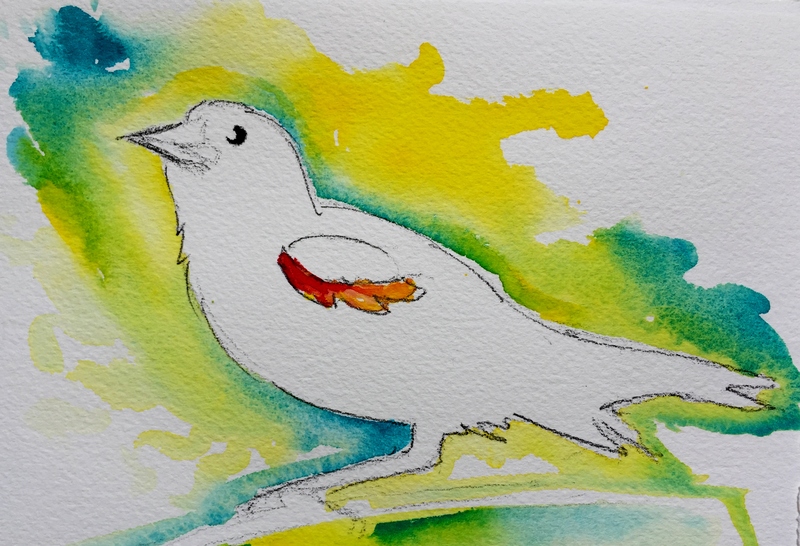 < Sorry Charlie … Draw a Bird Day (the real one) is COMING! And yet, despite your busyness, this bird works perfect! Yay! Laura, just enough time and look how lovely your birdie is! Enjoy your Sunday. Trying but it’s back to work day for me. Hi Laura, I’m so glad you’ve had a few moments to post your beautiful bird. I like how you used the bright colors to surround the bird, and just the touch of red. I can hear his tweets of joy! I hope you are getting some respite today! I love the ghost bird effect…it works especially well for the red-winged blackbird. Thanks, Kerfe. I’ve been meaning to check on your Mets. They’ll come around. I can’t believe how well the O’s are playing! And we won’t even talk about the Braves! so nice to see a cheery bird from you Laura! Sorry your birds got cancelled today in this crazy weather. Hope you get to enjoy some more art time! Nice! Yeah, still scares me lol. I haven’t decided on a venue yet. I’m not into all the social media stuff needed to promote on Etsy. I want to paint more and be on devices less. Lovely Birdie I could draw them all day if I had the time Laura. Not sure why they capture my heart and imagination. Thanks Kath. I agree, there is something so irresistible about them! I’ve always wanted to be a seagull lol. Funny Laura I have always imagined flying! there are times, yes…. when we really do have to say to ourselves that it is our ‘job’ to just show up to do the art. Thanks 3D! I could really use those prayers. I need to get to bed really early tonight for the big push this last week. Laura – you are so amazingly creative! I wished we lived closer and I could hang out and soak up some of your talent! Lovely painting, beautiful eye-catching composition and adore the spot of red on the wing. Remember to pace yourself! Always nice to see your posts. Thank you Haunani! Your comments are so kind and I appreciate your wisdom! Your bird is wonderful and I am happy to learn about draw a bird day and the beautiful story. Thank you Barbara! We were so happy to as well. Happy Sunday to you. And thanks for your comment! Laura, thanks so much for your kind words! Another year has flown by! I love the illustration of your bird. The vibrant splashes of color have me in the mood for spring. If only the weather would cooperate. I hope your week goes well! Hi Donna! Thanks, I thought him being all black, and shades of black being so hard to convey, that painting him in reverse might be easier lol. I could spend the rest of this year painting and drawing images from your and Kathy’s blogs! Thanks, Jill! Would appreciate your prayers too, my friend! I hope you’re feeling better these days as well! Simple yet very detailed Laura, the background compensates for no infill colour and highlights the red wing and again a twinkle in the eye. Thanks, Denis! I’m glad you liked this one. I hope to be seeing (or at least hearing about) your artwork very soon! I love the greens and yellows… Looks just like the leaves where the RWBB perches on a bright sunny day! Thank you so much! Sorry it took me so long to respond! Glad you enjoyed! Lovely painting Laura – the birds are a plenty these days! Thanks so much Mary! I really appreciate you stopping by! Can’t wait to have time to paint again! I’m with you. We are doing a number of house projects inside and outside that has put art on the back burner. Hopefully I’ll be able to get back at it in May. I love this! Defining a subject by negative space is not easy but makes for thought-provoking art! Thank you; you’re so kind! This is an award-free blog, but I truly appreciate the thoughtful nomination. Have a wonderful weekend.